See sample below. Turn around time for a standard listing is currently 48 hours. Your site will appear above all standard listings for maximum exposure. This, along with the complete description of your business, helps New Yorkers see you first and learn about your business. Turn around time is 48 hours. 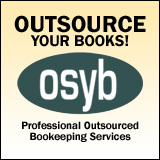 OutSource Your Books (OSYB) provides professional outsourced bookkeeping services. Our QuickBooks certified professionals can provide both web-based record keeping and hands-on accounting services. In addition to the premium listing and its benefits, you receive a banner ad that appears in your primary category. These are subject to availability and limited to only 9 per category. * NY listing applies to Web sites and businesses that primarily serve New Yorkers and/or New York-based customers. New York metro businesses (e.g. NJ, Long Island, and Westchester) may choose this option. * Non-NY listing applies to Web sites or business that operate nationally or serve a region outside the New York metro area.